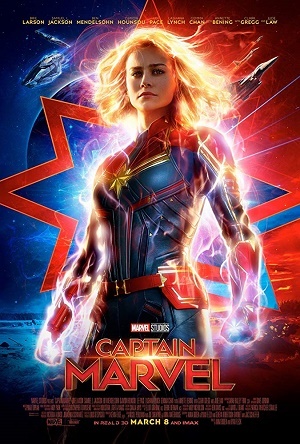 Tells the story of Carol Danvers who becomes one of the universe most powerful heroes when Earth is caught in the middle of a galactic war between two alien races while Danvers, herself have to find the answer of who she really was. First big debut film for the couple Anna Boden and Ryan Fleck who’s on their path on becoming directors with big budgeted films welcome to the Marvel’s club. Oscar winner Brie Larson leads the film as Carol Danvers while Samuel L. Jackson who used CGI to be the young Nick Fury. Gemma Chan who was expected to have a more significant portion on the film instead just played an insignificant part as Minn-Erva. Ben Mendelsohn played the role of Talos and Jude Law becomes Yon-Rogg and Annette Bening as Mar-Vell. At first, the expectations were very low looking at the trailer. But, instead, the film is a big bomb! The film is basically the history of how the Avengers was created and how Nick Fury lost his eyes. Brie Larson performance is to die for, Larson abled to played the character of Carol Danvers so humane and so relatable. The humor is there and especially the scenes where there’s Goose (the cat), and there is some big and small plot that would be revealed which will keep the audiences guessing. Looking at how this latest Marvel film goes, Marvel starts to focus more on its story like DC. Comics, which if turned out well, it would be very successful like Wonder Woman, Aquaman or with Marvel’s Black Panther but if it doesn’t turn out well, it’ll end up like Justice League. The differences from this film and Wonder Woman is this film didn’t show any sexuality of Captain Marvel, and this film is one of the films that didn’t sexualized the female character at all. The film also includes many strong women and also how the little girl Monica Rambeau, the 11-year-old daughter of Carol’s BFF Maria Rambeau is pictured as a smart is another point to add and many messages like you’re beautiful as you are (the scenes where she talked with the alien) This film is full of notes that you wouldn’t feel like you are being taught. How the scenes are being told is fantastic. Especially in the scene where the flashbacks of Carol Danvers childhood is being shown when she is being held. It is very touching. The film also taught you to accept yourself and conquered yourself. This film is a female empowerment film that every women and man in the world needs to watch. You need to know that you are worthy and capable of doing anything you want to! Big applause for the film! Just one sentence to describe it. Can’t wait to see Captain Marvel in Avengers: End Game next month!